Cats who like catnip will generally roll around, rub their faces in it, salivate, jump, run around, and purr for about 10 to 15 minutes after a big sniff. Different cats have different reactions, but these are usually the signs that show your kitty is enjoying the herb. Afterwards, your kitty will calm down and most likely feel like napping. The effects on your feline friend may vary due to the quality and potency of the leaves. This will differ based on where and how the plant was grown. If your adult cat doesn't respond, you may want to try another toy or source of herb to see how your cat likes it. Also, older leaves or an older toy will not be as potent and may not interest your kitty. If you can't refill the cat toy with fresh leaves, you can also try rejuvenating the toy with catnip spray. Regardless of whether you give your cat a pinch or two of the dried leaves or give your feline friend a toy to play with, the pleasurable effects will be the same. Some cats like to eat the leaves, and this is usually safe for most cats. If your cat is one with a sensitive stomach and vomits or has diarrhea as a result of eating the plant leaves, then you'll want to give your cat a toy with the leaves safely inside, instead of directly giving him the herb. A toy will allow your cat to enjoy the effects without eating the leaves. It's the smell that sets off your cat. Many toys can be refilled with fresh leaves, or you can just roll the toy around in a plastic bag of the crushed leaves or use a spray mist. In some cases, felines may become aggressive while under the influence. If you have more than one cat, it's best to test their individual reactions to make sure they don't end up fighting. Otherwise, two cats can have a great time together while enjoying their 'nip. Your kitty might also be a little more aggressive with you and you could end up with a scratch or two if you play with her during this "high time." Scientists haven't been able to figure out how or why Nepeta Cataria (the scientific name) affects most cats the way it does. But they have isolated the part of the plant that causes the euphoric reaction. The plant contains a non-poisonous chemical called Nepetalactone. Nepetalactone is an aromatic oil found in the stem and leaves of the plant. It's the smell (rather than taste) of the leaves that sets cats off. If you grow your own plants, or buy fresh leaves, you'll get a better reaction from your cat if you crumple the leaves to help release the oil. Only about 50% to 70% of all felines will be affected by this herb. Whether or not a cat will exhibit the ecstasy experienced by most felines is genetically determined. So you may have one cat in your household who is mad about it and another who is totally disinterested. Before you give up on your cat, you may want to try organic catnip. The organic plants are supposed to be more potent than conventionally grown as they are supposed to have a higher concentration of Nepetalactone; and are certainly healthier for your cat and the planet. Nepetalactone is the part of the plant that gives your cat great pleasure. Kittens are not affected by this plant. If your kitten is genetically predisposed to enjoy it, then she will probably start reacting at about two months old. It may take up to six months for your kitten to start reacting. If your kitty hasn't started reacting by the time she is six months old, then she probably will never enjoy it. However, you may want to try a couple different sources or leaf-stuffed toys before you give up. The quality and potency can vary from source to source. So if your cat doesn't react, it could be the particular leaves that she isn't reacting to, rather than catnip in general. The leaves can also be used to introduce your kitty to a new bed, cat tree or other piece of cat furniture. Sprinkling the leaves or using a spray on cat furniture allows your kitty to associate a good feeling with it. Your cat will also end up marking the furniture with the glands on the sides of his or her face. This makes your him or her more likely to use the furniture. Of course, this only works if your cat is one of the many who enjoy a bit of the 'nip. 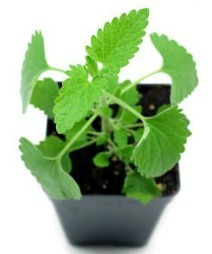 Catnip Plants - How to grow your own to provide your kitty with the freshest quality. Catnip Addiction - See this article to find out if there's anything to worry about. Catnip Toys - Make your own.